Ellen is delighted to become involved in The Art Ranch project. She resonates with the values it puts into practice, the environment it creates for children by cultivating an atmosphere of curiosity and learning, and the exploration of individual artistic expression it encourages within a safe and nurturing context of fun, compassion, and community. 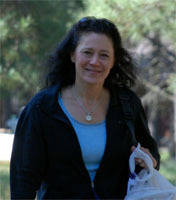 Throughout her personal development and professional practice, Ellen’s activities have reflected her belief in the value of integrating mind-body fitness, her respect for the individual’s uniqueness and experience, and the process of meeting challenges using multi-disciplinary approaches, all the while coordinating with team members of diverse expertise. Ellen began her study of psychology as an undergraduate at McMaster University where she initiated the Music and Movement program while volunteering on the psychiatric units. Later, she integrated her interests in dance and science by attending summer dance programs at York University, the Rubin Academy in Israel, and Les Grand Ballet-Jazz in Montreal, completing her Honors Bachelor of Science degree at the University of Toronto. After applying her undergraduate training as a research assistant at the Addiction Research Foundation in Toronto, Ellen then pursued graduate study in Clinical Psychology at New York University where she coordinated the first Mind and Music summer conference and obtained her Master of Arts degree. She continued her graduate training at Northwestern University Medical School’s Clinical Psychology program, the University of Chicago’s Department of Behavioral Medicine, UCLA’s Neuropsychiatric Institute clinical internship program, and earned her Ph. D. in Clinical Psychology with a Specialty in Health Psychology from Northwestern University. After graduating with her Ph.D., Ellen became the Coordinator for UCLA’s Adolescent Depression Out-Patient Treatment Program, where she worked with a national research team to the completion of a multi-site project. At the same time, she conducted evening stress management groups at UCLA for the Heart Enhanced Lifestyle Program (HELP) for Cardiovascular patients, which included Nutrition, Exercise and Yoga components. Presently, Ellen is in private practice in Los Angeles as a Licensed Clinical Psychologist with a specialty in Health Psychology. She uses an integrated treatment approach to facilitate mental and physical health in her work with individuals, couples, families, and groups, and she conducts seminars on topics related to health psychology. In addition to her professional clinical activities, Ellen is a certified AFAA aerobics instructor and has taught dance and fitness classes in the Toronto, Chicago and LA areas.